By now you should all know that I love combining vintage and modern pieces together. I have a huge vintage collection so naturally I just wear them with the rest of my wardrobe without even thinking about it. The great thing about vintage is that the chances of seeing someone else wear it is unlikely. This white asymmetrical skort, on the other hand, has been seen on bloggers all over the world for like half a year now. To be honest, I am getting a little tired of seeing it. The piece itself though is structurally unique and quite chic so I gave in. I put my own unique spin on it with a vintage oversized daisy blazer from Quiet Unrest Vintage, out-of-this-world Fume Rose necklace by Holst + Lee, Safari Nights ring by Samantha Wills, Simone bag by Lauren Merkin, and these amazing croc print strappy booties from Choies. I usually wear brighter lipstick colors such as true red or orange or coral but I thought I would wear a darker shade this time for a change. Vintage oversize daisy blazer by Scarlett Jrs. c/o Quiet Unrest Vintage. Heathered gray leotard from F21. White asymmetrical skort c/o Choies. Fume Rose necklace by Holst + Lee c/o The Collective. Simone bag c/o Lauren Merkin. Safari Nights ring c/o Samantha Wills. Croc print strappy booties c/o Choies. You're right, that skort is EVERYWHERE. But you can rock it pretty well and you make it as yours. Love this combo!! I've seen that skort all over the place but I think this is my favorite way I've seen it styled. 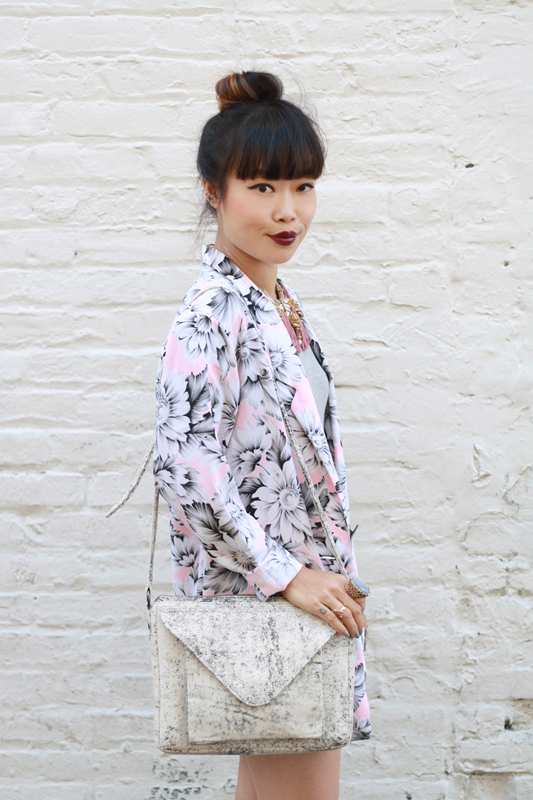 Your vintage blazer looks perfect with it! Vintage and modern just pairs so well together. I love that aesthetic too. Thank you! I tried my best to make it different than the rest! Wow, I love how perfect this outfit is! Love the modern and vintage combination! And your hair and lipstick are also perfect with this outfit! Thank you so much! Thought I would switch out my usual bright red and orange lips for a darker shade! LOVE that necklace. I want to DIY the crap out of that! Love the colors in this whole outfit. Thanks Kate! 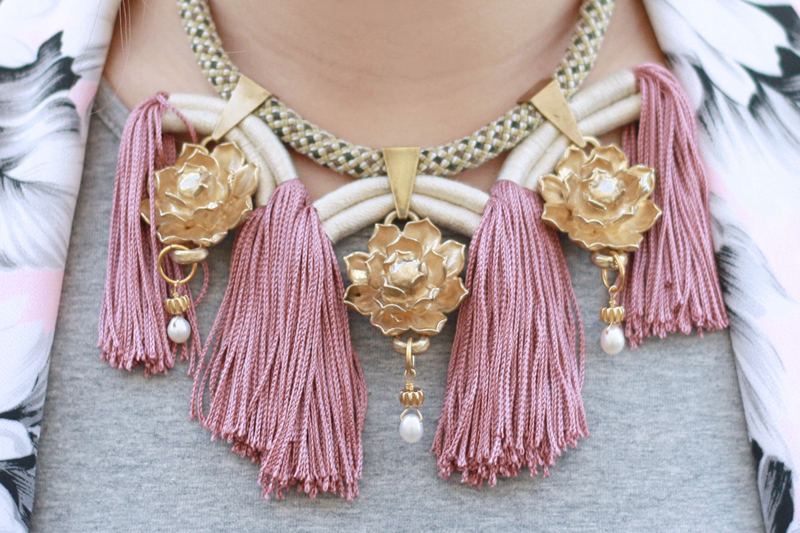 You should check out Holst+Lee, they have really awesome statement jewelry!